CouchWarriors Inc. is a Not-For-Profit association which organises regular esports gaming events in Melbourne and Brisbane. Created to energise the fighting game community, our biggest event is Battle Arena Melbourne (BAM), drawing contenders, sponsors and thousands of spectators from all around the globe. Created by Brendon “Loki” Watson and Brendan “Zan” Tonkin in 2006, CouchWarriors started as a an informal community group, beginning with an inclusive monthly tournament event for social play and ranking battles. 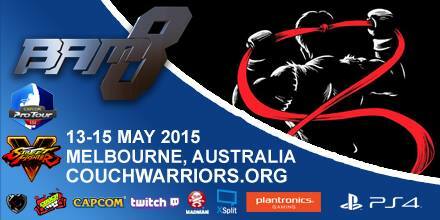 The CouchWarriors Ranbat event series has since served as the heart of the Melbourne fighting game scene . The project has blossomed into large events like the major annual, BAM and providing tournament services, support and resources for fighting game community events and beyond. CouchWarriors Inc is available for specialised event activations. We have provided Qualifiers and tournament services to Melbourne Symphony Orchestra’s PAX Australia, VideoGamesUnplugged, OzComicCon, EB Games Expo, along with product launches and previews for publishers, and more. CouchWarriors’s continues its role as an events management group, and supports community outreach by providing training and entry into the scene for new players, while engaging with other events and organisations for engagement of the dynamic fighting game community. As a not for profit, incorporated association, and by conception, CouchWarriors is an open, egalitarian group run by a committee formed of community members. Anyone is welcome to attend regular meetings and have input into the direction of events like BAM. We have a good mix of newer members and players with experience and strong institutional knowledge for running events. Officer positions are determined at Annual General Meeting via nomination and election. Aaron “Borgie” Borg: Committee Member. Abi Ji: Lead Tekken Tournament Organizer. Alex “MM|PrettyCoolGuy” Scott: Committee Member. Anthony “Tones” Schweitzer Ducusin: Tournament, Social Media Support. Daniel “Berzerk” Chlebowczyk: Former President and Strategy Manager. Daniel “Spoony” Finegan: Former President and Tournament Organizer. Darren “DreadTech” Taing: Former President and Tournament Organizer. Dean “Din” Bonnici: Tournament and Event Support. Dylan “SNC” Lake: Tournament Organizer and Social Media Manager. Hazel Argueta: Administration and Operations Support. Jason Lee “Duon” Mustapic: Committee Member. Josh “Jash” Southern: Tournament Organizer. Matthew “Ignis” Allsop: Tournament Organizer. Megan “Megz” Webber: Partnerships Coordinator. Rame “Rame” Jeboo: Tournament Admin. Sarah “AzuraSarah” Morris: Administration and Operations Support. Vincent “Forte” Lim: Tournament Organizer. Will “Will Smith” Smith: Committee Member. Ellis “Flex” Johnson: QLD Treasurer, Tournament Organizer. Gabe “jaBBu” Najarro: Events and Graphic Designer. Johnathan “Narcissus” Li: Tournament Organizer. Luke “Lukozade” Mengler: Committee Member. Samuel “Bad” Brisbane: Tournament Organizer. Tom “Yiggs” Ho: Tournament and Stream Organizer. Jason O’Callaghan: Stream and Operations Manager.